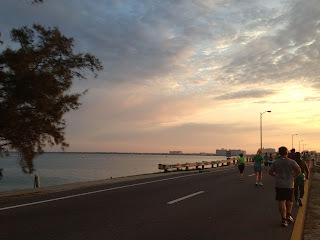 The day before the First Watch Sarasota Half Marathon, I sat there wanting to cry instead of being excited for the race. I had such large doubts for running this 13.1, which would have been my 5th Half since December. I had a nagging foot pain, issues with my big toe. Meanwhile Gabe has multiple issues going on and everything hurts when he runs. I've never gone into a race weekend with so much doubt. I broke down and asked one of the race coordinators if we could switch into the half marathon relay and she graciously said OK. So here is the thing with running a relay vs. the entire race. I found myself jealous on race day! Jealous of those running the entire thing. I felt like I was going to miss out on the whole experience and I would have to live vicariously through Gabe on the second portion of the race. While I was sad to miss out on the second half of the race but when I got to the relay transition sign, my foot thanked me. 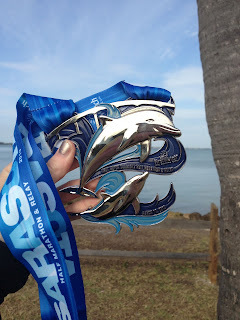 So instead of a recap of my 5th half marathon, here is my recap of my very first half marathon recap! 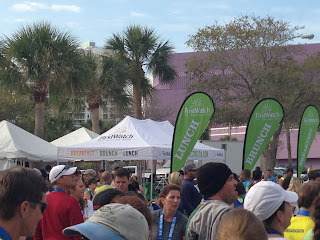 We stayed at the Hyatt Regency Sarasota which was located in the adjacent parking lot of the start/finish line. This means we got to "sleep in"! It was very nice to have the alarm clock go off at 6am on race day vs. 3am, 4am or 5am. 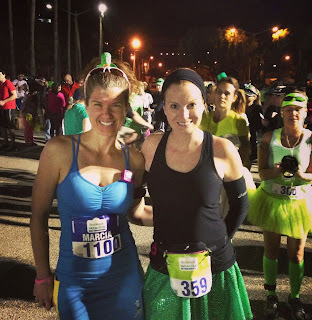 As this race took place on St. Patrick's Day, I got my Irish on with my Green Sparkle Skirt and headed out the door. We literally rushed out the door, 10 minutes before the start of a race. I hated feeling rushed and will never do that again. I started the race out stressed. 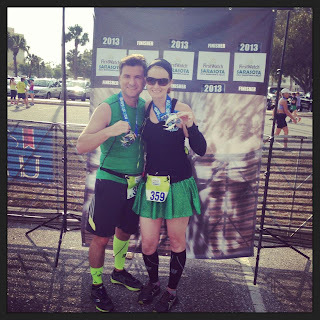 I luckily found my friend Marcia, who was running the half marathon. I was happy to find someone to start the race with! 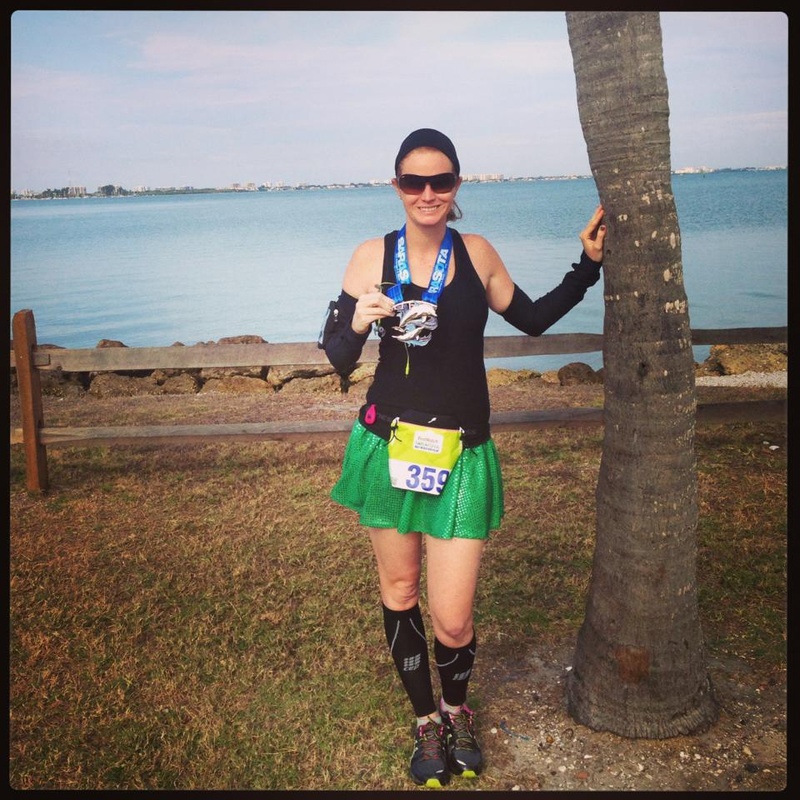 Marcia is a Galloway method coach in Jacksonville and was running 2/1. I usually run straight for the first few miles then switch over to Galloway midway through. Since I was only running half of a half, I decided to run with Marcia. 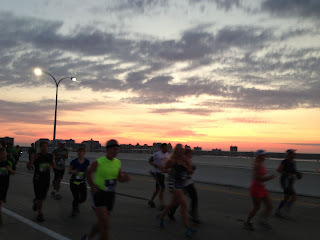 I normally post photos of every mile marker on my recap but the first few turned out blurry. I was too interested in taking beautiful scenery photos this time around! At the start of the race, it was still dark outside as you can see from the photo above. This means we got to experience the first half of the race with a beautiful sunrise. 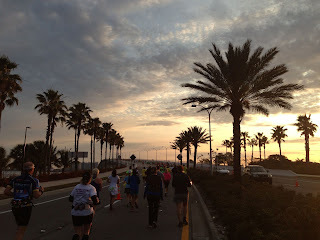 I had to stop in awe multiple times because my 6.5 mile leg of the race was the prettiest race experience of my life. Oh John Ringling Bridge - you are no friend of mine. 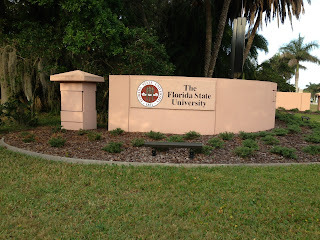 I am a FL girl, born and raised. I don't do incline training. The largest bridge I have ran is the Harbor Island Tampa bridge. 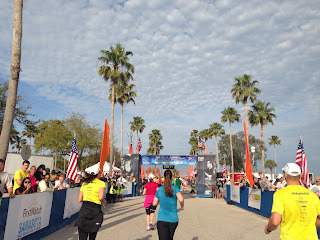 Now I am about to run over the Ringling Bridge twice on my leg of the race.....the incline of this bridge is 60ft. FUN! Once I got through the first passing of the bridge, I found myself in St Armands Circle, passing a ton of shops and restaurants. 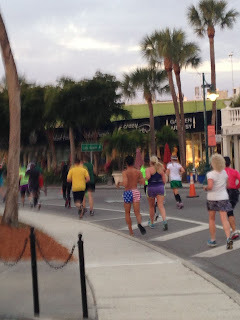 It was so encouraging to see random strangers cheering us all on as they were drinking their morning coffee. Around the circle, I was passed by a gentleman wearing American flag short shorts and sandals! I later saw this man at the finish line and his shoes were off. Crazy town! Coming back over the bridge, I was once again welcomed with a beautiful sight. This made the second passing of the bridge a little easier. Once I started the climb, I sat in awe over the beauty of the bay. This is such an amazing town and to be able to run alongside thousands of other runners while taking in these beautiful sights was such a wonderful experience. Here is Gabe's recap of his 7.6 miles: I was freezing waiting on Megan to finish her portion of the race. It was around 55 outside and dark when her portion of the race started. I was lined up in a relay transition area waiting for the hand off of the ankle bracelet. I was jealous that she got the pretty part of the race but that also meant she got the bridge. Once the transition happened, I took off and instantly wanted to quit. I wasn't feeling great (both of us were dizzy and nasuas all day Saturday), my legs were on fire and everything hurt. My first two miles were the slowest they have ever been since my last four of the Disney Marathon. Around my 4th mile, I started picking up pace and the miles started passing by fast. When we first switched over to the relay, I was a little sad that I wouldn't be doing the whole thing but once we were finished, I quickly realized it was the best decision we have made. When I got the text that Gabe was at mile 12, I got ready to go again. We joined back before mile 13 to run across the finish line together. We came in 77th place of the co-ed relay runners, Team #359, IRUN4WINE 2:23:41 (10:58 minute mile). I would have liked to see a better time since we had shorter distances to run. Yet I was able to keep up with my average pace of 10:30 during my 6.5 miles with no training in three weeks. We posed with our medals - this race proudly has the biggest medal in FL and I was so excited to add it to our growing collection. It is HUGE. I am wondering if Gabe is trying to start a new fitness trend - running with one CEP pushed down. The size of this medal is crazy big compared to any of my others. The dolphins are strategically placed with the John Ringling Bridge in the background - as if I will ever need a reminder of that portion of the race!!! I absolutely love this medal. I felt the opportunity to take another photo opp with the medal, just because we were in a perfect setting for photos with a beautiful background. 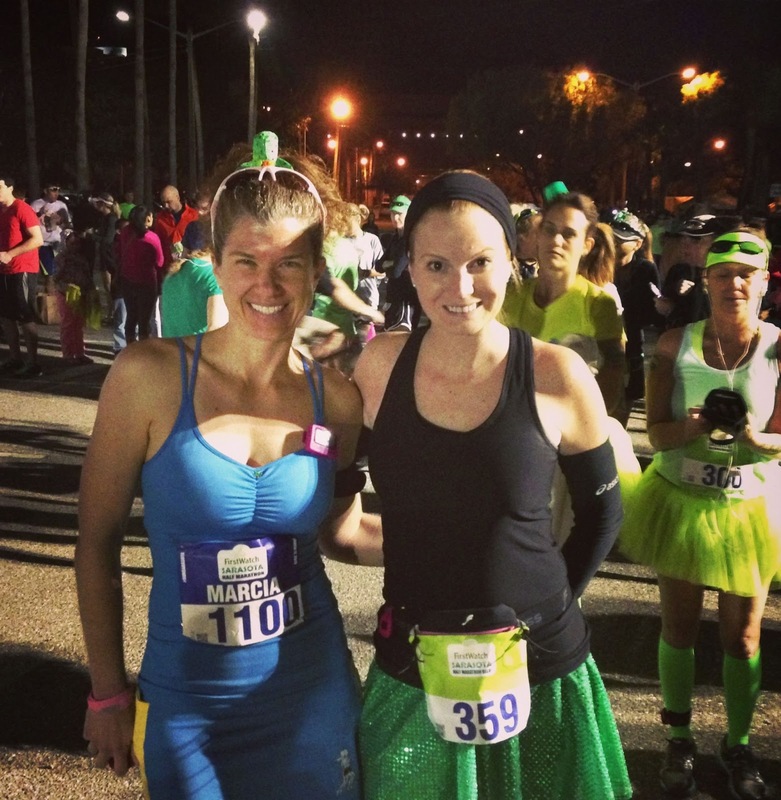 We headed back to the post race area so I could say goodbye to Marcia. Since this race is sponsored by First Watch, they were providing brunch. The line was very long so Gabe and I decided to head back to the Hyatt and grab a muffin prior to our 1:00 brunch at The Table Creekside. I did see a few people walking around with delicious looking yogurt parfaits though! 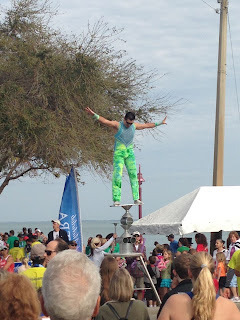 Since this race took place in the same city as the Ringling Brothers Museum, it would only make sense to have circus style entertainment. 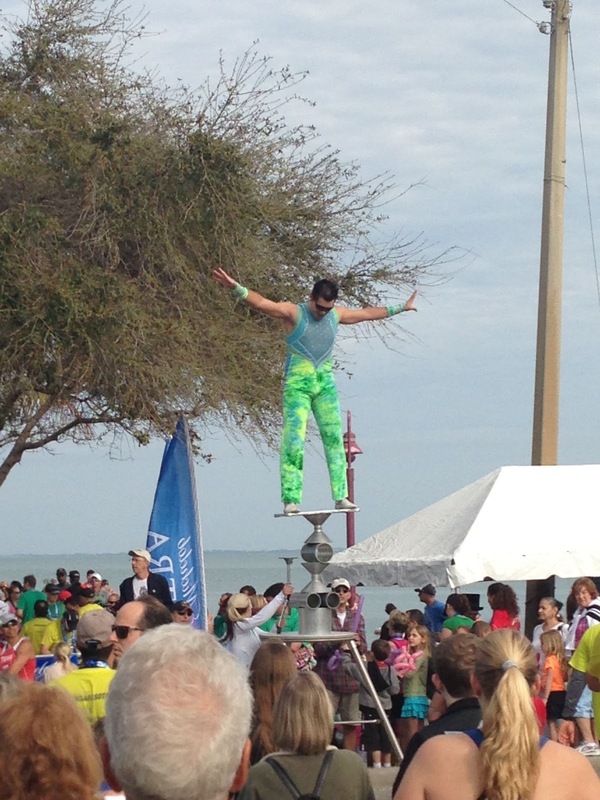 Gabe overheard someone in the crowd comment that this guy was on Americas Got Talent! For my first half relay, I have to say we were very impressed. I loved that we were out there doing this race, experiencing it with others. Yet I woke up the following day without feeling the morning after soreness and exhaustion. I would absolutely suggest running this race in 2014. It was a ton of fun and well organized. Speaking of, registration opens up today for the 2014 First Watch Sarasota Half Marathon and Relay and they are currently having a registration blitz! 50% off for the first 50 registrants. 30% off for the second 50 registrants. 20% off for all others until March 22, 2013! Prices will never be this low again! Click here for more information on the race and to register. What a beautiful course and medal! 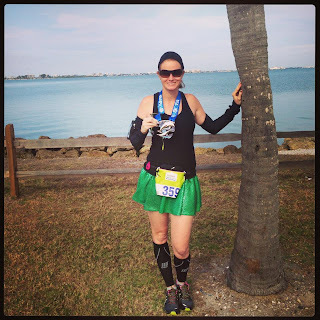 Great recap, I am thinking about running this race next year! Congratulations on your first half relay! Congrats on (yet ANOTHER) successful race! Love your green skirt, awesome job!! What gorgeous scenery to take in on a run!!! Your photos are beautiful!!!! You look so skinny and cute in all those pics too :). Love the Gabe insight too..so cute :). What a fun run with the cool route, circus stuff, FSU, etc.